As in any other industry, real estate investing carries its own jargon. From terms like “IRR” and “Cap Rate”, it can be difficult to figure out what it all really means without some guidance. That’s why our team of real estate experts have selected the most important terms investors we feel our investors should know. If you have questions about any other topic or jargon term not defined below, contact our support team at [email protected] or by phone at 844.END.VEST. An accredited investor is an investor that either has an individual income exceeding $200,000, a joint spousal income exceeding $300,000, or has a net worth of over $1 million, excluding his primary residence. Accredited investors also include those who are general partners, executives, or directors for the issuer of a security being offered. 'Accredited investor' was a term coined by the United States Government when devising Regulation D (Title II of the JOBS Act), which allowed for certain investors to fund private businesses and startups in exchange for equity. Since each real estate project is structured like a business, investors can invest in real estate. Until Title IV of the JOBS Act (Regulation A+), only accredited investors could invest. For example, in 2014 a married investor with a joint spousal income of $350,000 goes online and finds a real estate deal. He does his proper due diligence and decides that he wants to invest in a property on one of the many real estate investment platforms. He can verify his accreditation and then contribute money in exchange for equity in the deal. CapEx, short for capital expenditures, are expenses related to physical or material improvements/additions to a property, such as new equipment, machinery, or renovation. Capital expenditures are considered an expense and are therefore structured into the deal. Capital expenditures will improve an already existing property in some way. The company must spread the cost of the expenditure (the fixed cost) over the useful life of the asset, if the improvement will improve the state of the property. The company can fully deduct the cost in the year of expense if the ‘improvement’ is made simply to maintain the current condition of the asset. The greater the capital expenditure for a firm, the lower the free cash flow to the equity. The firm adds air conditioning to an establishment. Cost of the expense must be spread out over the useful life of the asset. Air conditioning in the building, which is already faulty, breaks down. The firm purchases new parts so that the air conditioning will work in the same manner it did before. Cost can be fully deducted during the year they made the repair. A capitalization rate, also known as a cap rate, is one of the most reliable metrics in real estate in order to measure the strength of an investment. The cap rate is the ratio of Net Operating Income (NOI) to the value of the asset. A commonly misunderstood concept surrounding cap rate is the significance of cap rates. Cap rates are not a function of NOI. The best way to think of cap rates are to think of them as fixed numbers, that can only be changed by larger macroeconomic factors. Lower cap rates in retail, small offices, and apartments are generally purchased by owner-users. Owner-users do not rent the property, and pay a premium to own and use. When participating in a project, you always want to exit a lower cap rate than when you entered, because lower cap rates are indicative of higher value. For example, consider a multifamily townhouse with a purchase price of $1,000,000. It has an annual net operating income of $100,000. Since cap rate is the ratio of NOI to the price, then the cap rate is 10%. Now, you want to renovate the townhouse. Suppose the new improvements made to the property will allow you to increase your NOI to $150,000. Manipulating the cap rate equation, $150,000/0.10 = $1,500,000 (the new value of the property). You don’t make any improvements to the property, so the Net Operating Income doesn’t increase. But, you hold it for about three years, and the market increases greatly. The typical cap rate for multifamily townhouses in the area is now 6.7%. By using the cap rate equation, you find that $100,000/.067= $1,500,000 (the new value of the property). Cash-on-cash is a rate of return, which is the ratio of the annual cash flow generated to the total cash invested. The main strength of using cash-on-cash as a value metric is that an investor can see how much money he is actually making on the money he invested, free from mortgages and expenses. The main weakness of the cash-on-cash method is that it doesn’t take into account other benefits of real estate, such as appreciation, equity accrual, and tax benefits. $15,000 / $200,000 = 7.5%. Common equity is the most basic form of equity in a deal. Investors that hold common equity are general paid last and have no direct claim to the asset. They have no previously agreed upon return rate, but instead share all of upside of the deal. This equity is junior to other types of equity and debt, such as Senior Debt, Mezzanine Debt, and Preferred Equity. If the deal goes bad, these investors cannot claim a part of the property. For example, suppose a townhouse with a purchase price of $1,000,000. The bank has given a loan at 70% LTV, which is $700,000. Bank is considered senior debt, so they get paid first, and they lay claim to the asset if it the mortgage cannot be paid. We’re the sponsors of the deal (we found and will manage the deal). We are going to provide 5% of the total price, or $50,000. That leaves $250,000 that still needs to be funded. So, we turn to equity. We can either offer preferred equity or common equity. We ask some friends for funding in exchange for preferred equity (a promised upon rate, claim to payments before common equity). They are able to provide $150,000. We still need $100,000, so we turn to friends-of-friends and strangers, offering them a piece of common equity. Comparable properties are properties that have characteristics similar to the subject property. You also use comparable properties to see at what price you can sell condos (see example below). Examining comparable properties is one of the most powerful tools in property valuation. Characteristics that are similar include location, price per square foot lot size, building size, air rights, zoning, insurance, taxes, and finishes. Another important factor when looking at comparable properties is the date of sale: the more recent the date, the stronger the comp. This is because markets and prices are constantly changing. For example, a townhome sold in 2009 would not be a good comp; the real estate market was different. The best comps are similar properties that are in contract. Once many comparable properties are examined, data must be compiled. When compiling data (mostly price per square foot/rent per square foot), examine if there are outliers. If there are, find out why. If there are no reasons for the differences, include them. Not including data for the sake of making a deal attractive will only hurt your investment in the end. Here we can see the more obvious way that Properties 2,3, and 5 are outliers. Find out why and decide if they would need to be included. It becomes clear that there is a growing trend among condos in the area. Crowdfunding has existed since about 2009 in the form of reward or gift equity. Sites like Kickstarter and Indiegogo were aggregators for projects in which people could give money, and would get a small token or simply nothing in return. Since the Jumpstart Our Business Startups (JOBS) Act in 2013, equity crowdfunding has become popular. Crowdfunding can be used for investors to access deals to which they’ve never before had access, including deals in difficult to reach locations or deals with high costs. For example, a ground-up construction of a building will cost $10,000,000 in equity. Traditionally, this equity would be split among a few privileged investors. With crowdfunding, suppose the minimum investment is $10,000. If 1,000 investors each contribute $10,000, they will have successfully funded the project and own 0.1% of the project. The Equity Multiple is the ratio of the total money received to the money invested. This is a metric used to gauge investor returns. In an Operating Pro Forma Statement, since the anticipated total money received and total money invested are capped at a certain amount, changing your personal investment will not change the equity multiple. For example, if an investor contributes $10,000 and receives $15,000 back, his equity multiple is 1.5. The higher the equity multiple, the more attractive the investment. The Floor-Area Ratio (FAR) is the ratio of buildable square feet to the lot size of a property. An FAR of 1.0 is equal to the lot size. Different zones and districts in different places have different maximum FARs. Oftentimes, properties are either underbuilt (Current FAR is less than Maximum Allowable FAR) or are slightly overbuilt (Current FAR is greater than Maximum Allowable FAR). It is common for FARs to be expressed to the tenth place, e.g. 6.2 or 9.0. Additionally, FAR does not mean number of floors: it simply signifies amount of square feet, independent of building height. For example, if you can build 100,000 square feet on a 10,000 square foot lot, then your FAR is 100,000/10,000 = 10.0. Here’s a tougher, but common example. If a 12,000 square foot building sits on a 6,000 square foot lot, and the total buildable square feet is 48,000 square feet, what’s the current FAR? What’s the Maximum Allowable FAR? Current FAR: Current Square Feet/ Lot Size = 12,000/6,000 = 2.0. Maximum Allowable FAR: Buildable Square Feet/Lot Size = 48,000/6,000 = 8.0. So, you can build 48,000-12,000 = 36,000 square feet, which has an FAR of 36,000/6,000 = 6.0. Hard Costs are costs that are directly related to the construction and/or development of a property. This includes grading, excavation, materials used, landscaping, and carpentry. Hard costs vary by market. They are the most expensive in New York City. Another consideration when determining hard costs is the finishes/quality of a construction. Will the building have granite countertops, stainless steel appliances, and smart technology? Or, will it have laminate countertops, vinyl appliances, and no technology? All of these will impact the hard costs of a project. The IRR, also known as the Internal Rate of Return, is the point at which the NPV (Net Present Value) of all future cash flows is 0. The higher the IRR, the more desirable the deal is. In other words, it is the rate at which the investment breaks even. In general, the IRR of a project should be greater than the minimum IRR needed (also called the hurdle rate). Furthermore, the IRR of a given project should be greater than the IRR of other similar projects. Comparing alternatives to examine a best option uses the concept of opportunity costs. The ‘normal’ level of IRR varies by asset type, market, and economic stage. For example, a hotel in the fast-growing economy of Wroclaw, Poland will have a different normal IRR from a townhouse in the growing, but steady market of New York. Additionally, the ‘required’ IRR varies for each firm. This depends on each firm’s strategy. What’s the firm’s required risk? What about the required return? In which markets does the firm want to invest? All of these questions and more contribute to the required IRR. The JOBS (Jumpstart Our Business Startups) Act is an act set in motion by Congress to ease lending to small businesses and stimulates small business creation. There are three titles of the JOBS Act: Title II, Title III, and Title IV. Each creates a unique part of the crowdfunding landscape. Title II went into effect on September 23rd, 2013. This act allowed for small businesses to reach out to accredited investors for funding. This new rule was called Rule 506(c) of Regulation D.
Title III has not yet been implemented, but allows private companies to issue shares of their companies (much like publicly traded companies), on a new market. This would call for new rules and regulations. Title IV went into effect on June 19th, 2015. Also known as Regulation A+, this allowed for unaccredited investors to invest in small businesses and startups alongside accredited investors. While the regulatory landscape has certainly evolved in the past few years, there are constantly new rules and guidelines to follow. To get an easier handle on the most up to date JOBS Act regulations, check out the Crowdfunding Cheat Sheet prepared by Mark Roderick, one of ENDVEST's corporate partners and a leading attorney in the space of crowdfunding. Leverage describes using borrowed capital to increase the potential return of an investment. In other words, the concept of leverage allows you to use less of your own cash in order to make larger returns by using other sources of money, like banks and other institutional investors. You want to purchase a home priced at $1,000,000. You have $200,000 cash available for a down payment. The bank gives you a loan for 80% of the cost of the home. In effect, you are using $200,000 to buy a house worth $1,000,000. Assume monthly payments are in the amount of $5,000. After 10 months, the house increases in value by 10%, to $1,100,000. But, since you now have $250,000 invested ($200,000 initial plus 10 months at $5,000/month), the $100,000 increase is actually a 40% increase on your cash invested! The Net Operating Income (NOI) describes the difference between your total revenues and your total expenses. In other words, NOI is the income a property generates (before repaying debts). Revenues include rent (the largest source of revenue), parking, vending, and laundry. Expenses include taxes, insurance, maintenance and repairs. By increasing your revenue or decreasing your expenses, you can increase your Net Operating Income. In general, the higher the NOI, the greater the value of the property is. $100,000 - $5,000 (5% of potential rental income is lost through vacancies)= $95,000. $95,000 + $7,000 + $1,000 + $2,000 = $105,000. Preferred equity describes a type of equity that has a promised-upon fixed return in addition to a portion of the remaining upside in a deal. It is junior to all debt and equity except Common Equity. $800 dividend (8%) and $4,250 principal returned to investor. Remaining investor balance is $5,750. $460 dividend (8% of $5,750). $460 dividend (8% of $5,750) and $5,750 principal returned to investor. In addition, investor receives share of net profits in the amount of $2,778. Remaining investor balance is zero. Price Per Square Foot (PPSF) is a property value metric, which is the ratio of the price of the property to the total square feet. Price Per Square Foot is also used for hard and soft costs of a real estate development deal. These are generally fixed costs. For example, the price of constructing new development, high-end condos in New York City will be over $600/sq. ft. 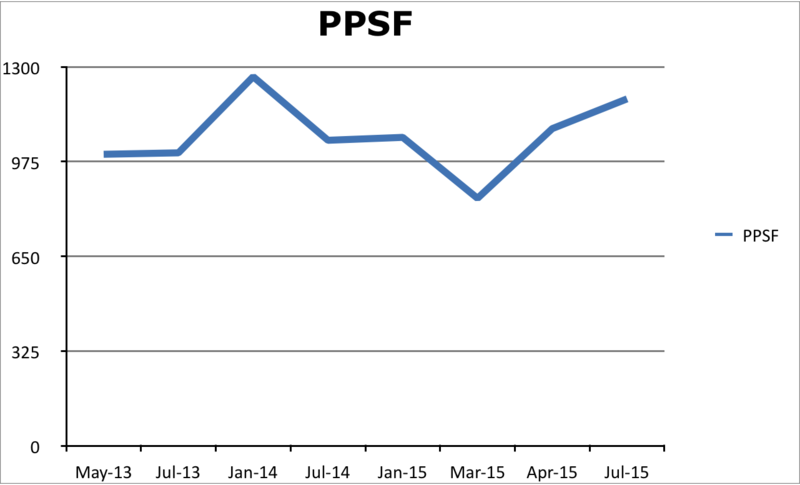 The causes for change in PPSF are similar to the causes for change in overall property value, such as location, finishes, inventory, and other market factors. By manipulating the PPSF ratio, if you divide the Property Value by the PPSF, you find the size of the apartment. 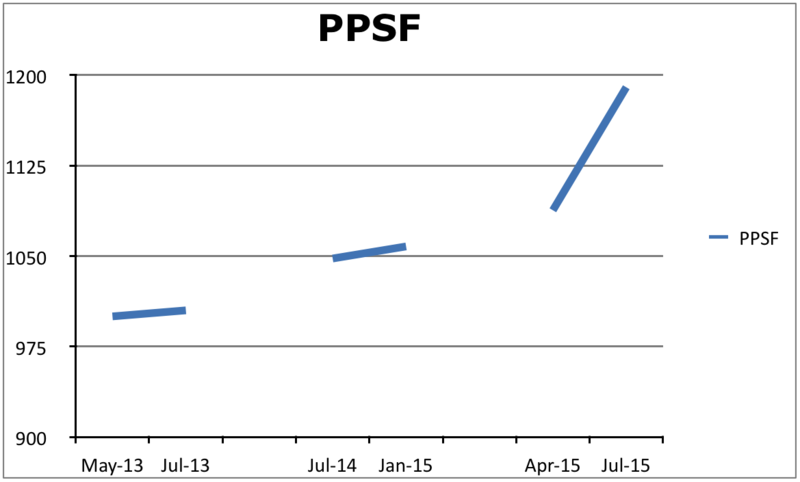 In general, the more square feet you buy, the cheaper the PPSF becomes. $400,000 / 2,000 sq. ft. = $200/sq. ft.
Return on Investment (ROI for short) is the ratio of the benefit of the investment to the cost of the investment. The higher the ROI, the more attractive the investment. ROI is the most inclusive return metric, because it includes benefits not covered in other methods, such as Cash-on-Cash or IRR. These added benefits include equity accrual, appreciation, and tax benefits. For example, suppose an investment that costs $1,000,000. The building will be sold for $1,100,000, and there is roughly $50,000 saved from tax benefits related to owning the property. Therefore, we divide the total benefits by the total costs. The benefits are $100,000 in appreciation and $50,000 in tax benefits. The costs are $1,000,000. $150,000 / $1,000,000 = .15 * 100 = 15% ROI. Traditionally, investors are limited to choosing their risk level, while financial advisors/custodians (third parties that hold the account) make the investments. These investments include stocks, bonds, mutual funds, and ETFs. A self-directed IRA is a type of Individual Retirement Account that gives the account holder greater flexibility and freedom in choice of investments. Although a custodian still must hold the account (to prevent unnecessary withdrawals), there is no financial advisor. Instead, you designate which exact investments you want, and the custodian handles the legalese and executes the transference of funds. Investments include precious metals, real estate, and private investments. There are restrictions on transactions, such as the people with whom you may deal and the types of investments you may make. “Disqualified individuals” are among those with whom you may not transact, such as family members. Currently, only 2% of IRAs are self-directed. Ready to learn more about how to set up a Self Directed IRA and use it to invest in real estate. Head over to our Beginner's Guide. Sensitivity analysis is one of the most valuable tools in due diligence. It assesses both the feasibility and flexibility of a project. Sensitivity analysis involves changing deal metrics such as size of building, price per square foot, loss ratio, to examine the changes’ effects on profit margins. You can maximize the utility of a sensitivity analysis by changing the most sensitive variables, within reason. For example, consider loss factor. Many assume loss factor for an apartment building at about 15%. If we change our loss factor to 5% or 30% (both unrealistic assumptions), we might be falsely attracted to or deferred from a deal. But, 12%-18% is realistic. Imagine we find out that if our loss factor is only 12%, our project becomes almost twice as profitable. But, if our loss factor is 18%, our project becomes one fourth as profitable. If we can’t achieve 15%, the deal might not be worth our time. If we can achieve a loss factor lower than 15%, there is greater potential. We are either confident in our ability to restrict loss factor, or we are not. Sensitivity analysis defines what decisions must be made. The sponsor is the party responsible for finding, acquiring, and managing real estate. They generally provide a small percentage of the equity in a deal (less than 10%), in exchange for the proportional share of profits. For managing the property, they also receive a larger portion of the upside (from reversion or sale). The largest risk of using a sponsor is verifying their expertise in a certain property type, location, or market. Other risks include lack of sponsor motivation due to lack of incentive or confidence in a project, and that interests may be misaligned between the sponsors and investors. The largest benefit of using a sponsor is the expertise that sponsors bring. The other largest benefit is a hardworking sponsor, due to proper incentives, which can lead to a better sale price or otherwise attractive opportunity. ABC Development Corp has recently purchased a plot of land in Los Cabos, Mexico and wants to build a Marriott flagged resort.Initial development costs are expected to be $10,000,000. ABC has committed $1,000,000 hard cash and has an LOI from XYZ Bank for $7,000,000. ABC lists their deal on ENDVEST to raise the final $2,000,000 of equity. In the scenario described above, who is the sponsor? Need another term defined that is not listed here?